Sgt. Brian Newsome, Mostyn Evans, Anna Donner, Lilly Tate, Sheriff John Hinton and Trooper Kamal Nelson. Lilly Tate getting make up on Anna Donner for the Grim Reaper activity. 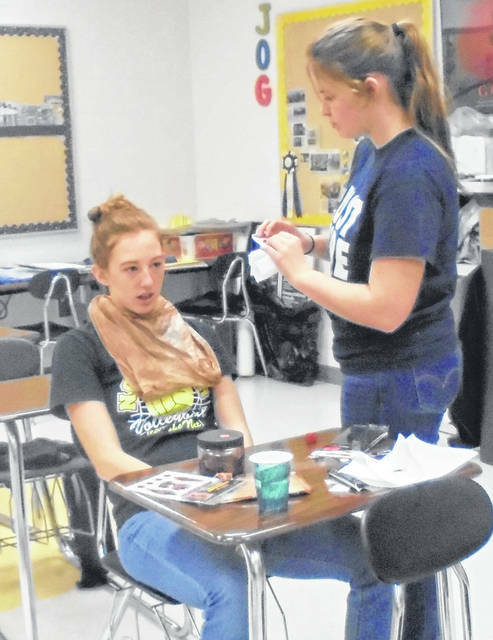 IBERIA — Northmor Youth Safety Council has been busy with activities for distracted driving. 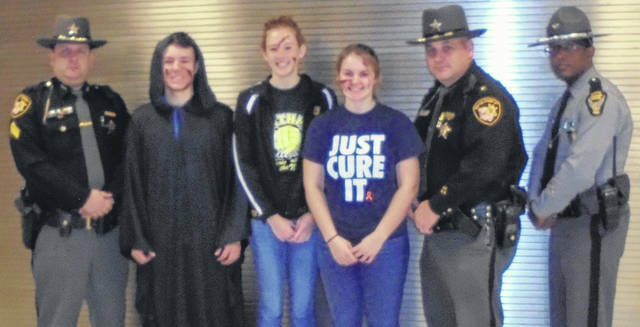 Just before Christmas break, we had the Grim Reapers, Mostyn Evans, Anna Donner, and Lilly Tate going around the high school tagging students with accident scenarios, and announcements being made at the end of each class period of the tragic accident. Also on the same day we had the D0NOT Text and Drive. It was big hit with students in October and we will do it again in April, which is Distracted Driving Month. Sheriff John Hinton, Sgt. Brian Newsome, and Trooper Kamal Nelson served breakfast to the students. We served 300 donuts for breakfast and the students enjoyed seeing our officers. Northmor Youth Safety Council is doing activities throughout the year with the high school students. We did DUI goggles and throwing a disc through a hula hoop with Sgt. Newsome. Our next activity is DUI goggles with the corn hole game and walking a straight line. The council is trying to keep distracted driving one of the top priorities with students driving safely.